Whether you are a young or a mature woman, the Rose Noire Absolue fragrance is a great accessory for expressing your delicate and sentimental side. Introduced in 2000 by Giorgio Valenti, this perfume combines juicy top notes of freesia and tangerine with lily of the valley middle notes and sandalwood base notes, creating a subtle flowery aroma. Suitable for daytime wear, this perfume will make you feel inspired and chic throughout the entire day. This perfume smells so good! I got it as a gift and at first thought it was in the cheap side but I wore it and every time I do it’s akways “what are you wearing? It smells good! A hit! I love this Rose Noire Absolue. It gives the light scent of roses. This is indeed a rare scent. It's a very sophisticated rose. It smells like a elegant evening in a little black dress. I feel I made a really good investment by buying this. The bottle is very pretty, too. If you love the scent of roses, I highly recommend this. 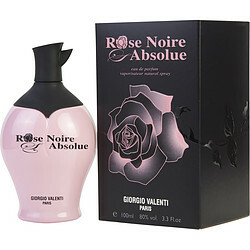 I tried Rose Noire Absolue because I wanted a rose based fragrance that was fairly inexpensive. It was suppose to be my weekday, back-up fragrance. Turned out to be a hit! Everyone always asks "what are you wearing?" Kind of nice that it's not a trendy fragrance that everyone is wearing.